Summerfest: Summerfest invites John Mayer, Again. Summerfest invites John Mayer, Again. John Mayer, along with new-by Colbie Calliat of Bubbly Toes fame is going to play the Marcus Amphitheater during Summerfest this year. He was here last year in support of his most recent album Continuum with the Grammy nominated, Waiting on the World to Change. It was a good show. Some concertgoers were disappointed as most of the set list consisted of new tunes, vs the first hits he had which brought him fame and fortune. 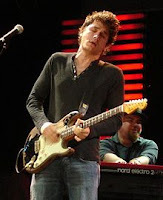 The John Mayer concert is Wednesday, July 2. With your John Mayer tickets, you have access to the rest of the Summerfest grounds. Ticketmaster is selling tickets starting this Saturday for $40 and up. I think little Colbie Calliat, ironically, will help this show along. Nothing against you John, but guy; you weere just here.